Welcome to the Warre Hive Construction Guide brought to you by The Bee Space. In this guide you will learn how to build a complete Warre beehive. 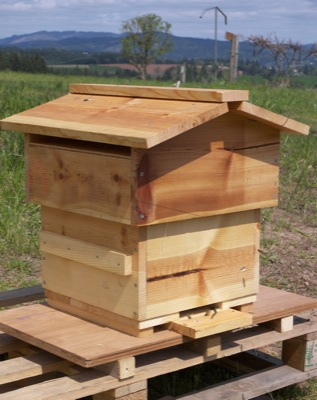 A Warre (pronounced war-ray) hive is a vertical or supered top bar hive that is simple to build and easy to use. The hive management methods of the Warre hive are quick and few, thus it is a suitable beehive for urban and backyard beekeepers. The Warre hive is smaller than a regular ten frame Langstroth hive so it consumes less energy and resources than a regular hive. The cost per beehive for all new materials is around $50-$75 US depending on what type of wood is used. It takes around 2-3 hours to build a complete Warre hive…definitely a nice weekend project. Let’s begin with an outline of the Warre Hive Construction Guide. Each title is also a link to the respective section. As I post each section, I will place a quick link in the right sidebar so it is easy for you to find. Also, just to let you know, you can click on any picture in the construction guide and view a larger version in your web browser. Now onwards to the Tool List for some tools you may need to build a Warre Hive. This entry was posted in Beekeeping Advice, Warre Hive Construction Guide and tagged beehive plans, diy beehive, emile warre, HowTo, Sustainable Beekeeping, Top Bar Hive. Bookmark the permalink. I much appreciate the detailed descriptions and photos that come with the plans to build a Warre hive – I’m eagerly awaiting the last three sections. I’m not familiar with the operation of such a hive and could you clarify that ALL of the boxes need to have the rebates to hold the top bars or is it only the top box. Abbe Warre drawings don’t seem to make this clear either. Jeremy – Thanks for the kind words! All of the boxes need to have top bars installed. The bees start building comb in the top box. When they encounter the top bars of the next box, they stop building and then start again from the top bars of the second box. If only the top box had bars, then your beehive would have one large comb descending through several boxes from the top box all the way to the floor. Not easy to work with. You can learn more about how to use the Warre Hive by reading “Beekeeping for All” by Emile Warre. Download it by clicking the link the sidebar. I will be posting a Warre Hive Beginners Guide in the near future based on this book. Stay tuned. I must say this hive does add to the basic hives most beekeepers use. I and my son want to begin beekeeping in the spring of 2009 and searching through countless websites finding something affordable is overwhelming, so I did other searches similar in making hives and “Ding” beespace was clicked on. I have stated my own free web page with our little beeswax lip balm and beekeeping info links. I hope you would not mind if I added this site to my links. I find this a interesting set up and might just give one a try. Quick question, I was not able to browse totally through the PDF book of the hive and wondered is a entrance feeder used or a top feeder? I like the detail of the step by step on making the hive. Keith – Thanks for your compliments on the site! In “Beekeeping for All” there are some instructions on building a top feeder for your Warre Hive. This top feeder is just a little shorter than a hive box, and it sits on top of the top hive box. The bees com up from below to feed. You can find the plans for the top feeder in the Warre Hive Plans. I will probably build some next year…another construction guide perhaps? Just thought I would write back to you in regards that the state I live in (Illinois) does not allow top bar hives, due to inspectors need to remove the frames easy and without pulling off the supers, so I was wondering if frame/foundations would work instead? Keith – there is a Warre Hive variant which uses a wire frame to guide the bees in building the comb. It is known as the Delon Variant. The wire is attached to the top bar and it helps to keep the comb away from the sides of the hive box. In this case the top bars are not attached to the rebates in the hive boxes. Here is a PDF document which describes this type of Warre Hive. Thanks for your question! EXCELLENT – I have just looked through your instruction pages and found them to be well written and with clear and concise illustrations, very well done indeed – 10/10. Having built a few already myself from recycled pallets I wish I’d found this before. Just one point, and it’s in no way a criticism, but given that since the good Abbot’s day we now have varrroa, wouldn’t it be worth showing an alternative floor with varroa monitoring tray? Robin – Good to see you! Thanks so much for your very kind compliments. I will consider the “floor with drawer” idea you mention. Seems it would be helpful to folks. Thank you for your idea! Hi Nick! After reading through this construction guide, I have to say it’s the best I’ve seen. My only wish is that it would be easier to print out so I can follow it easier while building my own hive(s). Have you considered maybe working it all into a pdf or something, to make it more printable? BTW – thanks for all the work you’ve put into this and for all the help you provide to us novices! Do you think it’s ok to build a Warre hive 17″x17′ ? Because I have some old wooden boxes that size. All I need to do now is to cut some top bars, and a roof. Andy – Yes, that should be ok. Remember, the concept of Warre Beekeeping is more important than the hive size. While there are a lot of advantages to building a 300 cm x 300 cm hive box, you can apply Warre methodology to a larger hive footprint. Good luck to you! Thank you so much Nick! I have been wanting to build a Warre hive for a year or so, but found it difficult to follow the instructions. Yours were so easy to follow! It took less than an afternoon! I’m doing it. I have two and a half cabinets in my shop left to finish…then…I’m a Bee guy. I have been entertaining the idea for years but when I stumbled across this site with the Warre hives, that’s it. I absolutly love the design! Plus, I have a huge veggie garden and the Warre hive will look soooo nice sitting there. Thank you so much. Also, I have been so worried about the Bee decline over the past few years. I grow all natural and lots and lots of herbs. The Bees are gonna love it here. If I can help in their recovery in any measure, I’m there. After all, the Bees have taken such good care of us all since time began. I’m done with two Warre hives. I have two packages of bees comming April 27th. I am going wild! I built frames instead of top bars for tying comb into in case I find a bee tree in the hills. I also built half frames to use in the hives. They have the top bars and 4 inch side bars, without a bottom bar. I saw them somewhere and they seem to allow the bees to build a more square comb with better structural properties. I bought an old used Langstroth hive, two deeps and one super. I want to put that out at a friends farm and compare the two types. Anyway, thanks for the great plans and all the good info. I have books ordered and I read for hours to learn beekeeping. When my “girls” get here, I want to be the best Innkeeper I can be! I don’t plan on taking any honey the first year. I want them to overwinter with all their stores. If there is a frame or two left come next spring at the first flow, we will taste it. I am doing this mostly for pollination and for a very small share of honey. Mostly though, I want to see if we can beat some of the problems by using natural size comb, essential oils for treatments of mites, and very little disturbance to the hives. Oh yea, I ordered the book, Queen Rearing Essentials. I am building Warre sized Nucs in which I will start raising my own Queens. I think local raised Queens from good stock is the best way to go. (I’m new but it makes sense to me) It is cold here so I ordered bees from Minnesota that have been bred to overwinter extremely well. The people I am getting them from, had to put a super on a week ago. They say these bees all wear little down ski suits and fly in blizzards! Now that’s the kind of Queens I want to breed! I have spent the summer with 3 Warre hives and 3 Langstroth hives. I have lost 4 frames of brood and 2 frames of honey in the Warre hives, due to the flimsy nature of top bars only. I have ripped comb due to ladder comb. Plus, the bees just start building in another direction. I personally don’t like the Warre hive design. I think the 8 frame medium Langstroths are the best hive made. Light when full and full frames to secure the comb are all you need. Warre doesn’t provide that. I built full frames for one of my Warre hives. It has no problems like the top bar only hives. The thing is, it is quite an undertaking to build full frames. The tools and shop experiance alone leaves out many people. Not to mention the time involved. Plus, some of the cuts are on small parts and quite risky for a novice. I just lifted a box off one of my Warres and two frames of brood fell out the bottom in the dirt. I am quite pissed right now and I don’t think my opinion will change soon….ever. I will let them over winter in the Warres but next spring they are going into Langs. Think I can sell 3 used Warre hives? Full frames in one, Partial frames in the other two and fresh, clean comb already drawn out. The comb that ain’t broken that is. We have a hive that built combs without bars…they showed up on our property and we were able to capture a swarmed hive and place them in a box. I went on a trip (month) came back and they had built an overflowing box of honey and comb. We are new beekeepers and placed a new box below it in an effort to move the hive down. Are there any tips you can give me as to how to extract the pure combs? Any advice for transferring a Langstroth nuc into the Warre’? I plan to use a standard 1” x 10” x 8’ which is 0.75” x 9.25” x 8’. Cutting the hive body sides all 12” I will get 8 hive body sides from each 8’ piece (less the kerf). That gives me internal dimensions of 10.5”x 12” x 9.25” = 1165 cubic in or 0.674 cubic feet. What do you think? The rebates will be in the 12” side not the 10.5” side and the hive body will have (9) 1″ topbars w/ (10) spaces of .30″. Is 1.3” between each comb ok and is 0.3” between each topbar (and the wall) ok? Hi Stanley, the math all sounds right to me. .25″ is pretty much the absolute minimum bee space so you should be good to go in my opinion. Sounds good mathematics, but it speak very poor bee biology knowledge! You are not keeping the Apis m. scutellata (the pure african bee subspecies) or the A. m. capensis (cape honey bee)…. aren’t you?? Do the mathematics to convert it to inches. I’m lazy! Just found your nearly two year old message today. Interestingly I did a redesign of Warre to use a 12″ x 12″ x 7.25″ hive body around the same time you did. I even did the cuts on the wrong side of the line the same way to get good material use. I had an issue with hive beetles and redesigned… a process that took almost a year to carry out because numerous living hives needed to be retrofitted with new top bars cut differently. After the redesign, my hives have done far better this year. There was a second issue with comb breakage a year before this design, so I dropped down to the 7 1/4″ height on ALL hive bodys. Then there was a final design idea of making two distinct hive sizes. So, I make one variant in a 12×12, and another in a 16×16. I find both to be workable and useful in their own right for different purposes. I’m currently working on getting a patent on specific aspects of my design if that is possible. Since the hives are stacked, I find no issue with bees rejecting them unless they only have one hive body… a mistake I made one day in trying to hive a new swarm into one box on a hot summer day. Truth be told, I knew better, but just plain didn’t have the hardware ready in time… and they re-swarmed out to a different hive 10′ away. Oh well, at least I didn’t lose them. Other than that one incident, they have happily accepted the footprint because they get multiple boxes. Once the hive beetle issue was solved, I believe the design size, and several other details not published yet are valid. I see many advantages, and went on to make other tinkering adjustments that I can’ publish yet. Suffice it to say that I have been repeatedly advised to get some details patented. Oh, and one last thing. Others may talk the talk of mathematics, but I am walking the walk of experience. I keep my bars at 1 5/16″ with the bar itself at exactly 1″ with a 5/16″ gap, and have had no problems with queens being able to go between layers, nor am I keeping africanized up here in Indiana. My developed hives stand 5-10 boxes high, most of them well filled. It’s just not a problem no matter how many math problems someone throws around. Anyhow, would like to hear how you have done with your hives. My husband and I are researching natural beekeeping. We live in the Arizona desert with summer temps. exceeding 113 degrees F. Can we use a top bar hive? I read that Warre hives don’t need to be tended but once a year. Can you tell me why that is the case? We want to be more involved with our bees. Our bee club has told us that all feral bees in our state are Africanized bees and we need to requeen every year with a fertile queen. That would rule out getting a swarm or really doing things naturally if we have to buy bees and our queen. What do you think? How many hives do you have? How long have you been keeping bees? How long have you used Warre hives? We have really enjoyed reading your blog. Thank you in advance for your input and help. I will begin building Warre hives from your plans later this month. I would like to have the option of using a screened or solid base. Have I missed a plan for a screened bottom board? Hi Roger, most Warre keeps I know don’t find it necessary to use a SBB. Of course that could be different in other peoples circles 🙂 I do get asked this question alot though so I have plans to put one together and document it this winter. Thank you for providing all this information. I built my hive based on your instructions. It turned out better than I could hope for. With my limited carpentry skills, it only required one afternoon. The girls are happy in the wet,wet, south coast of British Columbia. I could not figure out why the hive was growing so slow. It turned out a neighbourhood skunk was eating the girls. We build a higher platform for the hive. They flourished with the new height protection. My hive stands 2 meters from my friends commercial type hive. We have a quiet competition going.